Two Napa wineries and a brewery have filed for bankruptcy protection, while pursuing plans to recover and continue business operations. The limited liability company that formed Napa Smith Brewery and Winery filed for Chapter 7 business bankruptcy protection on Sept. 22. 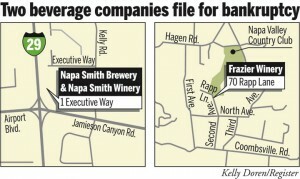 On Sept. 10, in a separate filing, Frazier Winery, located on Rapp Lane in Napa’s Coombsville area, filed for Chapter 11 bankruptcy protection. Both businesses filed in the U.S. bankruptcy court in Santa Rosa. Wineries, especially those selling premium priced wines, have been impacted by the recession, Vic Motto, chief executive officer of Global Wine Partners in St. Helena said.